When the one-on-one fighting game gold rush took place in the '90s it seemed that practically every developer or publisher had their own take on the genre, and as you might expect, not all of these efforts turned out to be classics. Sunsoft fared better than most - Waku Waku 7 remains one of the most unique fighters of its era, after all - but its first attempt was a little less memorable. Galaxy Fight isn't a bad game by any means, but even at the time of release it wasn't considered to be anything special. As the title suggests, this is a brawler with a sci-fi focus. 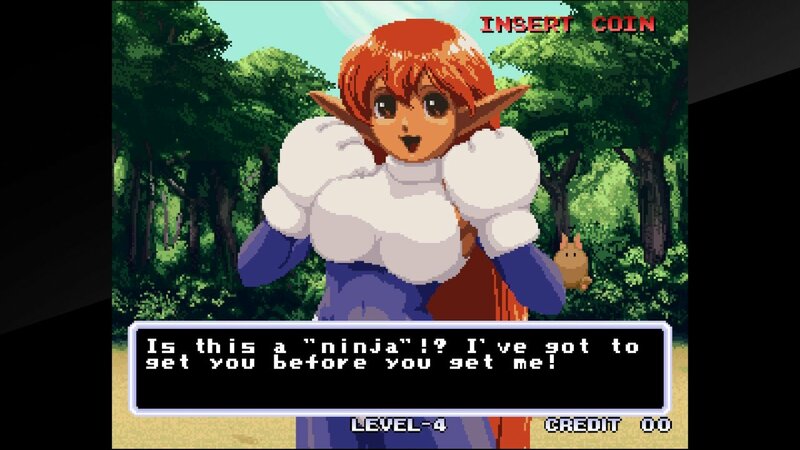 The action takes place on a series of different planets and the cast contains a robot, a space ninja and a cat-like woman with a chest so bouncy she looks like she's wandered in from a King of Fighters or Dead or Alive outing. The combat setup is surprisingly basic, even for a game released in 1995; you have three attack powers but these can be both kicks and punches, depending on the context, which instantly removes the layer of strategy introduced by Street Fighter II's separate kick and punch arrangement. There are no super moves to charge up, and outside of the ability to dash forwards and backwards, there's little here to separate this from the earliest examples of one-on-one fighters - and by 1995, there was simply no excuse for lagging behind. The only unique thing about Galaxy Fight is the fact that the stages loop infinitely, so you can't pin your opponent into a corner. Given that so many fighting games of the period showcase cliched thugs and martial artists, Sunsoft should get some credit for trying to do something a little different with the roster of Galaxy Fight. There are a few neat ideas to be found here; the robot Musafar looks a bit like the "Mk 2 RoboCop" from the second RoboCop movie, while the ninja Kazuma is effortlessly cool. 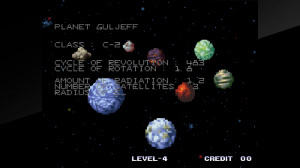 However, the rest of the cast are as dull as dishwater; "lead" fighter Rolf looks like a goofy guy in a spacesuit, cat-woman Roomi is irritating and the bespectacled G-Done looks like he's supposed to be in an entirely different game - he's just a typical earth thug with no special powers. In terms of visuals it's not an ugly game, but it's notable that the female fighters have more frames of animation than their male counterparts, a clear case of Sunsoft knowing exactly what the target audience of teenage boys were after back in 1995. To make matters worse, none of these fighters feel all that exciting to use, with very basic movesets and - thanks to the aforementioned lack of super moves and the restrictive nature of the three-button attack setup - very little scope for creative play. The computer opponents are quite aggressive and cunning, even on the default setting, which can make your first few goes feel a bit overwhelming. However, we found that sticking to basic combos is usually enough to defeat them. The narrow nature of the game's fighting mechanics doesn't exactly encourage tactical play, and within a few hours you'll be thoroughly bored and wondering why you didn't spend your cash on superior Neo Geo brawlers, like King of Fighters '98 or Samurai Shodown IV. Galaxy Fight looks fine and is enjoyable for a short period, but the dull cast, limited fighting mechanics and lack of genuine surprises make it a hard game to recommend, even to seasoned fighting fans. Sunsoft would do much better with Waku Waku 7, so if you like the look of Galaxy Fight you'd perhaps be better off picking that instead. If not, then there are already many other better one-on-one fighters available on the Switch, so there's no real need to check this out - unless of course you're a massive Neo Geo fan and simply have to own all of the range. Is that the worst reviewed NEO GEO game so far? I think it is. The majority have been very good though. Sheesh. I had some interest in this game before it got a Switch port. A good game. Just that when you compare it to the many other NeoGeo ports, this one seems out of place. I'd say the Neo Geo library has the highest ratio of quality titles to crap titles of any console. Often, certain games are not worth playing because a superior version of it was released later. (Example: Fatal Fury 2 and Fatal Fury Special) Even the "bad" ones usually have some redeeming qualities. 4!? Ouch! 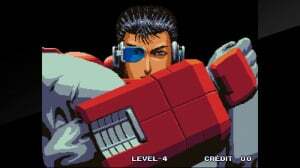 I have fond memories of this game despite it being made obsolete by "Waku Waku 7"... so I might be biased here. Is this a deja vu review? I thought galaxy fight was done already? @Shiryu @SLIGEACH_EIRE I can practically guarantee this won't be the last low-scoring NEOGEO game (though I'm surprised Galaxy Fight got a 4, I thought anything below a 5 had fundamental game problems). Burning Fight hasn't come up yet. 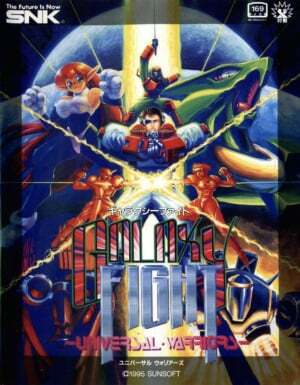 Maybe Ninja Combat as well if Galaxy Fight got a 4. AFAIK there was only the news post about the game release previously. Just gimme Samurai Shodown 2 - that's the one I'm waiting for! @Shiryu For arcade preservation sake, as @crackafreeze mentioned, seeing the occasional miss is bound to happen, and I do believe HAMSTER's intentions are to release 1 NEOGEO title a week like clockwork (for about 2 more years from now, give or take a week or two). I'm hoping that there's a break in the MVS action here and there so HAMSTER can release some of the other ACA titles that have showed up for the PS4. Like Gradius II, Salamander, Crazy Climber II, and whenever they get around to releasing it, The Ninja Warriors. Oh, and as much as I was won over by the big sprites, transformations, and music back in the day, Magician Lord has also not aged well. @SmaMan Agreed, because every NEOGEO game in itself is its own arcade game that must earn revenue for whichever operator owns the cabinet. Potentially, if an operator is not satisfied with a game's performance, it would leave a bad impression on the operator so they probably won't order another MVS cart, or even SNK game. Thankfully, most of the duds came out in the early life of the NEOGEO, with Galaxy Fight being around the last one, chronologically. @masterLEON I too am hoping Hamster's emulator starts covering other hardware on the Switch. I still like this one. It's got a rustic charm to it. I'd at least recommend it to diehard fans.